It was -3 degrees in the morning, with a -30 degree wind chill- the coldest day in a decade! I had no desire to get out of bed and was glad I had chosen to have my surgery during the most brutal month of the year. I doubt many people would have come out to my talks on the 12th and 17th anyway. Reports of collapsing roofs took over the news. Most people had leaks in their homes. And it was being reported that it would take another month before public transportation would be restored. 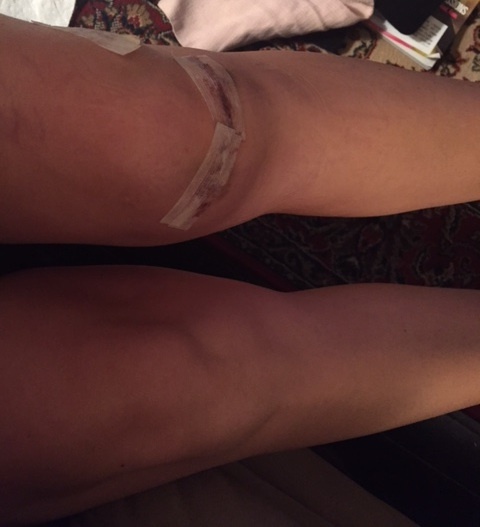 My knee was still locked in a semi-bend and I felt like a prancing horse whenever I tried to gingerly walk on it. 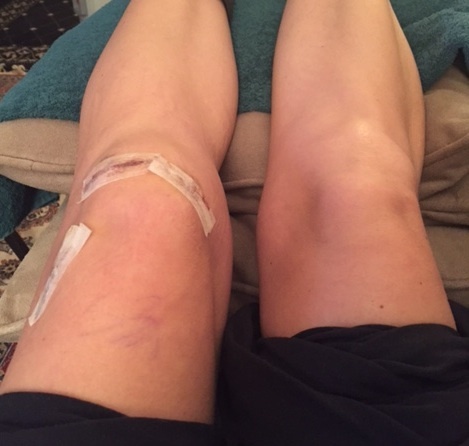 Before my surgery, I had asked for exercises to strengthen my quads. One of them was a wall sit. The nurse said I should do 10 reps of 30 seconds each, with a 15 second rest, 2 times a day! Given that I had only 6 days before surgery, that would mean I had time to do a total of one hour of wall sits! I actually ended up only doing it twice. I wondered how many people actually did those! I didn’t think the instructions were all that smart. They didn’t leave any resting time! Since I was growing bored with sitting on the floor, tightening my quads 90 times and holding for 5 seconds each, I decided I would rather up the intensity and get my “exercise” over with faster. I decided to try a wall sit. I don’t know why I didn’t take my socks off first, but I managed to stay for 2 minutes before sliding down onto my bum and resting on the floor for a bit. I thought that was pretty good for not even a week after my surgery! My intestines started to hurt in the afternoon and I did not feel up to doing any more of my exercises. I spent the remainder of the day on the couch. By midnight, I saw a knee starting to appear, however! Signs of progress! I could see the kneecap bruising turning yellow. My intestines never calmed down, however. At 2 and 3 in the morning, I was still awake in my bed, unable to sleep because of the pain. Just before 4, I got up out of my bed as quickly as I could and vomited. Ugh! Not again! Fortunately, I didn’t feel as weakened as when this happened in early January. I felt thankful for that! I returned to my bed and tried to rest. Two hours later, I vomited twice more. It was now 6am and I had not yet gone to sleep. I’ve been having a really rough go of it these last several months!! 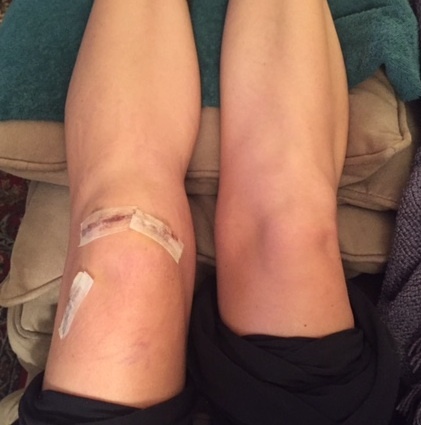 This entry was posted in Uncategorized and tagged meniscus removal surgery, meniscus removal surgery recovery, meniscus tear by Wendy. Bookmark the permalink.